which sustains us in a vast interdependence with everything. and is awesome in its integration and infinite existence. There are certain images in my head from my trip that are still affecting me. It was such an amazing adventure that words are much too puny a mechanism to try to describe what I experienced, so don’t expect a travelogue. But I truly came to know what the spiritual adept told me last year when she said I would die in India and be reborn in Africa, because it happened, just like she said. A holy man I met at the Mela, purely by chance — no, it was my good karma — changed my life forever. Just as she foretold, the old me died. The photo above is not one of mine, those will come later. But it is what I saw at the bottom of the Ngorongoro Crater in Tanzania, which is called the 8th natural wonder of the world for good reason. 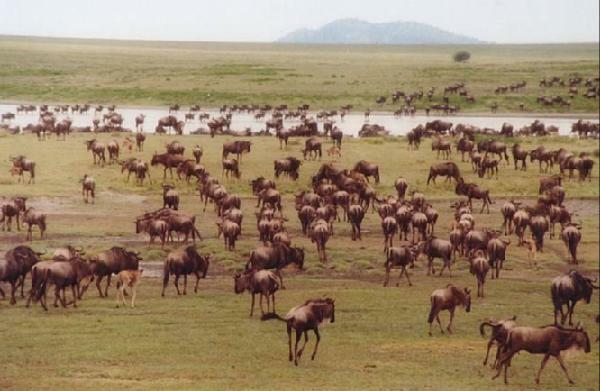 When you are standing in the middle of a wildebeast and zebra migration, an event that has been going on for thousands and thousands of years, you feel very insignificant. There are no sounds, other than your breath and the grunts of the animals and the wind and the swishing of tails, and you know deep in your bones that things you thought were very important, really aren’t in the whole grand scheme of things. Just as she foretold, a new me was reborn. that is, that thing we are supposed to come to truly know and feel as a result of an authentic yoga and meditation practice…. Maybe more so, dead in the heart-mind. “What are you?,” the Buddha was asked after his time under the bodhi tree. “I am awake,”, he responded. Of course one does not have to travel to Africa, or anywhere else for that matter, to experience this. Maybe you only need to sit in your own backyard and mindfully watch and listen and feel. During one session of my retreat I had the students do 30 minutes of walking meditation. None of them had ever done that before and their experiences were rather potent for them. They were amazed. And knowing that you know. Great to see you back. I'm sure India & Africa were life changing. Traveling has a way of getting past the cultural blinders and allowing new and profound experiences. You are right, however, the voyage does not need to involve leaving your own home/community. Essential wherever you are is a willingness to listen, watch, feel and open our hearts to the moment. Yay! You're back. And back with a very deep and profound blog at that. Welcome home, and I look forward to getting our dialog started again. Glad you had such a wonderful time. Let your stories and photos unfold as they will! Welcome back! Lovely post. The way you turn all travel into pilgrimage never ceases to inspire. Welcome home 🙂 So glad your back. Please tell about your travels!